Manifest.AR is delighted to announce their invitational show at the Corcoran Gallery of Art / Corcoran College of Art and Design, in Washington D.C.
After an international competition in 2011, FACT (Foundation for Art and Creative Technology) awarded Manifest.AR a commission to create significant new artworks in augmented reality. “Invisible ARtaffects,” part of FACT’s 10th anniversary exhibit “Turning FACT Inside Out,” is an exhibition of works in progress by the Manifest.AR artist group developed for this commission. AR2View is an exhibition catalog that brings together a collection of Augmented Reality (AR) artworks from nineteen media artists and two essay articles that review the field and the work inside produced for and distributed at the CAA’s 2013 Annual Conference in New York. Unlike most catalogs, the pages link to media artwork wherever you and the catalog happen to be. Download AR2View. The ongoing project “Transformation” by Tamiko Thiel researches daily life in the city and asks how we can transform our cities for a more sustainable future. “Transformation: Lehel” places ideas for the future, ranging from the possible to the improbable, as augmented reality artworks on site throughout the Lehel neighborhood in Munich, Germany. Images of the artworks formed part of Thiel’s large multiscreen video installation in the St. Lukas Church in Munich in October, 2012. “Transformation” is part of the project series “Overtures ZeitRäume” from pilotraum01 e.V., curated by Serafine Lindemann and Christian Schoen. 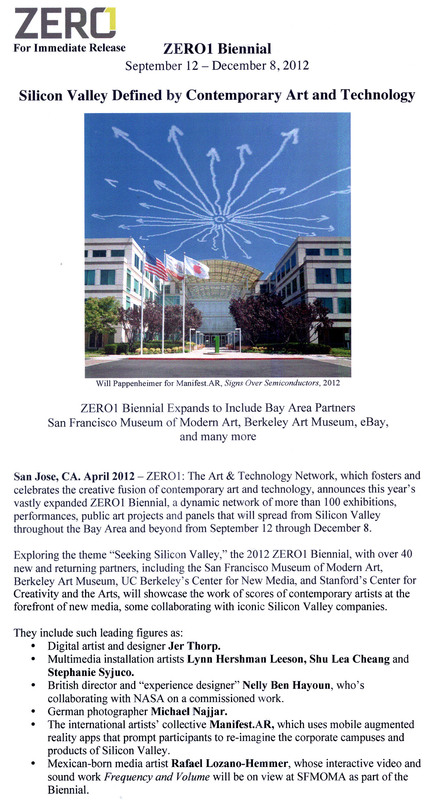 ManifestAR has established a citywide augmented reality public art exhibition for the 2012 ZERO1 Biennial with parallel components at the Samek Art Gallery at Bucknell University in Lewisburg Pennsylvania. 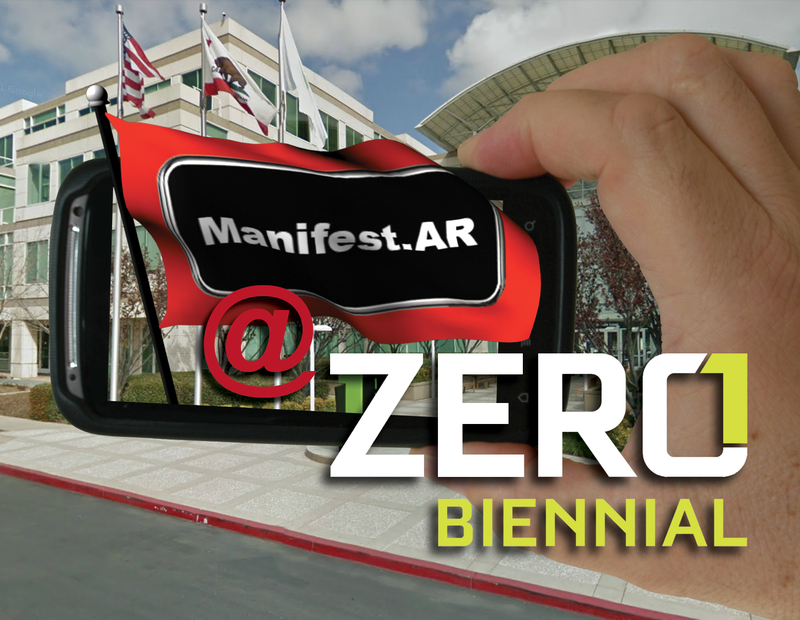 Titled “ManifestAR @ ZERO1,” the group draws on collective, participatory art practices centered on mobile augmented reality technology that aggregates and maps a series of artworks, which re-imagine and reinterpret the high-tech corporate campuses and products of Silicon Valley. Performative and site-specific works are located around the cities of San Jose, San Francisco and Lewisburg. The Copenhagen Art Festival will open 24. August 2012 with an event-packed programme until 2. 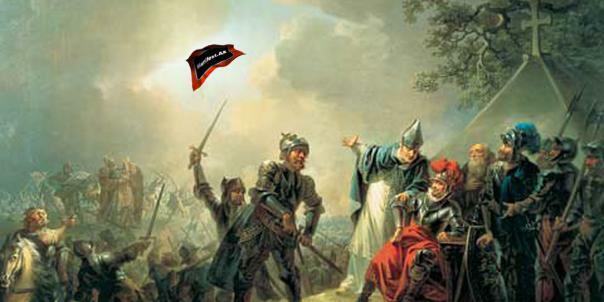 September. Hereafter the newly opened exhibitions will continue throughout the autumn. The festival is one of the major presentations of international contemporary art in the region. The Copenhagen Art Festival presents a multifaceted exhibition programme with art works by Danish and international artists. The festival will take place in the streets and squares of the inner city of Copenhagen and at the major contemporary art centres: Kunsthal Charlottenborg, Nikolaj Copenhagen Contemporary Art Center, Den Frie Centre of Contemporary Art, Overgaden Institute of Contemporary Art and Kunstforeningen GL STRAND. 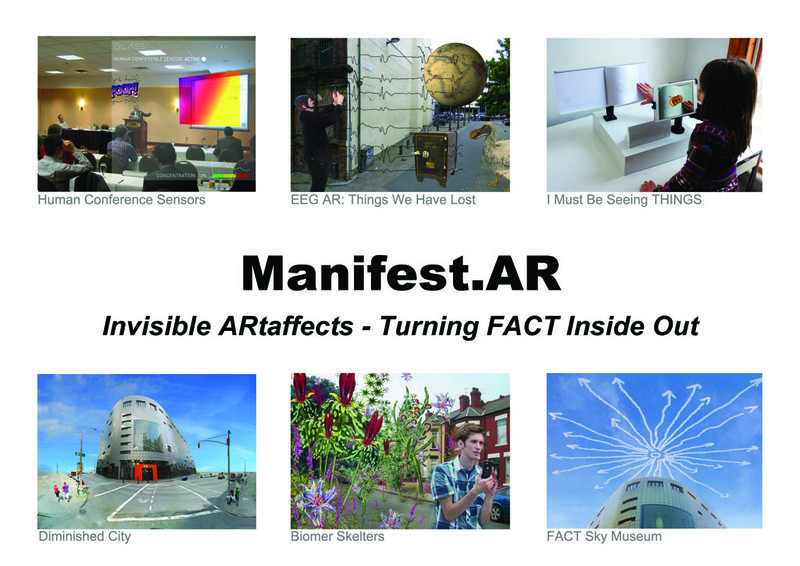 Manifest.AR is an international artists collective that create virtual actions in politically loaded locations, using digital technology (smartphones with a Layar app) to insert controversial monuments and messages. The group has also made unofficial, virtual interventions at MoMA, N.Y., and the biennials of Istanbul and Venice 2011. Manifest.AR intervenes in the Hayward Gallery show “Invisible”! ManifestAR’s work was not reviewed in the Independent. A celebration of Damien Hirst’s retrospective at the Tate Modern. Please see http://www.allhaildamienhirst.com/ for more information. By Tamiko Thiel, 2012.